For Derek's birthday last week, I wanted to venture out of the box and make something really awesome for his birthday dinner. I looked for a recipe online for orange chicken, and wasn't really seeing anything that I liked particularly, so I kind of combined a few recipes into one to come up with my own recipe and it came out really good! I am aware that this picture stinks! But, you can clearly tell that it looks just like the real Chinese restaurant deal! In a sauce pan over medium high heat until it boils, mix together the chicken stock, orange juice, orange zest, vinegar, soy sauce, brown sugar, garlic, ginger, and cayenne pepper. Whisk until the sugar is all dissolved. Let boil for 1 minute and then remove from heat. Preheat oven to 325° and spray a 9x13 pan with nonstick cooking spray. Toss chicken in the cornstarch until the chicken is coated on all sides. Shake off excess cornstarch and then transfer the chicken to the eggs, and coat the pieces thoroughly. Heat oil in a large skillet over medium high heat. When the oil shimmers, add the chicken. You don't have to worry about the chicken cooking all the way through because it will do that in the oven when it's baking, so just brown the chicken on all sides, and then remove from pan and pour into the 9x13 pan. Pour the sauce over the top of the chicken and then bake in the oven at 325° for 1 hour, stirring every 15 minutes. This really is a delicious recipe, however I think it is extremely important to follow all the steps for the best results, it seems like a lot of work but it's totally worth it in the long run! 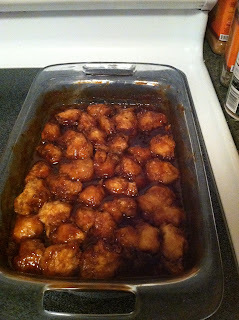 I love orange chicken - it looks and sounds delicious.